For the empire-builders of the Nanda-Maurya period the problems of welding the plural society in India were simply immense. The first step taken to solve them was a sort of politico- military surgery when Mahapadma Nanda uprooted by force the numerous Vedic Kshatriya dynasties who were ruling over almost the whole of the country. His surgical operation for simplifying the political map of the country was comparable to what Alexander did in the north-western part of the Jambudvipa only a few years later. The work of Mahapadma Nanda and Alexander taken together paved the way for the establishment of an all- India empire under the aegis of the Mauryas who raised the superstructure of an imperial edifice comprising almost the whole of the Jambudvipa and also took numerous steps for promoting the policy of religious toleration and inculcating respect for all sects-s-a policy which was so necessary in the plural society of India. Miss Meghna Goyal, the author of the present work, incorporates in her work, incorporates in her work the results of the latest discoveries and researches into an integrated Pattern. We sincerely hope that the present work will be found useful by researchers, teachers and students of ancient Indian history. Miss Meghna Goyal, the author of the present work, earned first division with distinction marks from the Secondary examination to M.A. She secured fourth position in Rajasthan state, also standing first among girl candidates in her Higher Secondary Examination (2004). In B.A. (2007) and M.A. (2009) she won gold medals along with distinction marks from the Jai Narain Vyas University Jodhpur. She did Certificate and Diploma courses in French language, standing first class first with distinction in both (2008-09). She has also cleared NET (June 2011). Several of her research papers and contributions have been published in reputed national journals and research monographs. Presently Miss Goyal is working for doctorate degree in her alma mater. For the empire-builders of the Nanda-Maurya period the problems of welding the plural society in India were simply immense. The first step taken to solve them was a sort of politico- military surgery when Mahapadma Nanda uprooted by force the numerous Vedic Kshatriya dynasties who were ruling over almost the whole of the country. His surgical operation for simplifying the political map of the country was comparable to what Alexander did in the north-western part of the Jambudvipa only a few years later. 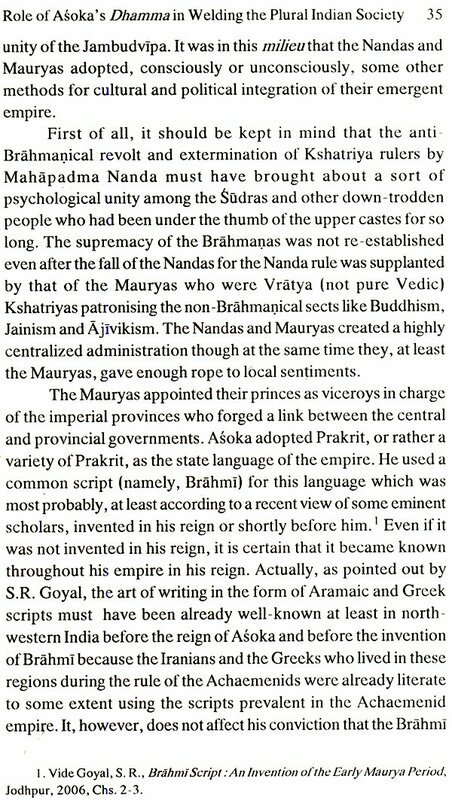 The work of Mahapadma Nanda and Alexander taken together paved the way for the establishment of an all- India empire under the aegis of the Mauryas who raised the superstructure of an imperial edifice comprising almost the whole of the Jambudvipa and also took numerous steps for promoting the policy of religious toleration and inculcating respect for all sects-s-a policy which was so necessary in the plural society of India. While preparing this volume I have tried to incorporate in it the results of the latest discoveries and researches and analyse and synthesise them with my own researches into an integrated pattern. I sincerely hope that the present work will be found useful by researchers, teachers and students of ancient Indian history. For its shortcomings I seek their indulgence and request them to send their suggestions for its improvement.